Banner photo: Tents and tables invite exploration at the fall recreation and activities festival on the East Field. Photo by Carolyn Lagattuta. 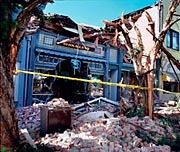 Twenty years ago this month, the 7.1-magnitude Loma Prieta Earthquake struck Santa Cruz and the Greater Bay Area. Your stories: Read first-person accounts of Loma Prieta, and add new ones. Talking inflation: Remarks by economist Carl Walsh were incorporated into a New York Times article about Fed Chairman Ben Bernanke's nomination to a second term. AIDS breakthrough: AIDS vaccine research led by biomolecular engineer Phillip Berman was covered by the San Jose Mercury News, Medical News Today, and other media.